A mobile electrical contractor company had a small maintenance workshop in which the pedestal grinder was a significant noise problem. 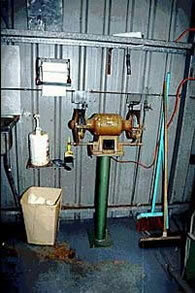 The pedestal grinder was bolted to the concrete floor using rubber mounts and rubber inserts/sleeves were used in the panelling to prevent the bolts from short circuiting the rubber mounts. Routine maintenance was carried out. The noise levels were reduced by 2dB from 104dB to 102dB.